In the March 3, 2017 article Yangon, Myanmar: World Bank Specialist Goes Back to Beginnings the Financial Times published a full feature on Avaaz co-founder Andrea Woodhouse. The article covers the following events. Neoliberalism would soon follow. 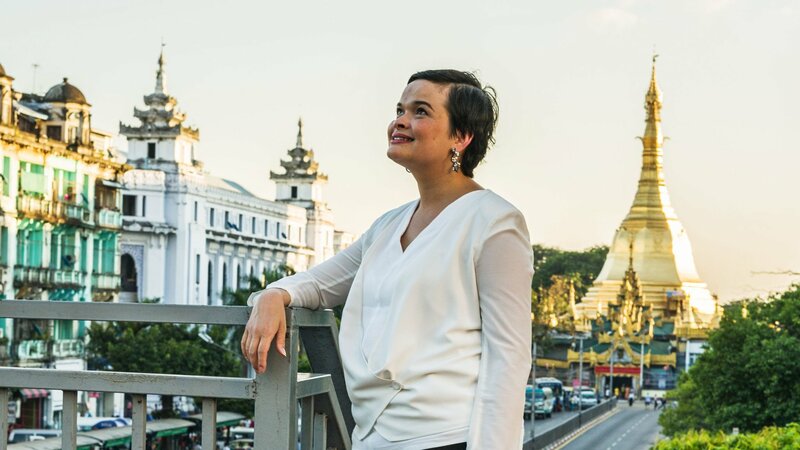 In 2012, Woodhouse would relocate to central Yangon “to settle as a social development specialist for the World Bank, which was re-engaging with Myanmar after an absence of more than 20 years” with her spouse and Avaaz co-founder David Madden. Not so coincidentally, Myanmar’s opposition leader Aung San Suu Kyi was released from house arrest, US and EU sanctions began to lift and “market liberalisation” was under way. Between 2011 and 2015 the cost of renting a typical apartment more than doubled with landlords catering to the wave of foreign money by demanding a full years rent up front. In the Montessori school where Woodhouse’s child attends (“one of maybe two expats in a class of about 15 to 20 children”) the school teaches in English rather than Burmese. Living in one of the poorest countries in Asia, wealthy expats (inclusive of Woodhouse and Madden) and Myanmar elites travel abroad for medical treatment and child birth. Woodhouse acknowledges her children are “extremely privileged”. The vast majority of expats rent. Typical two-bedroom, serviced apartments in the capital cost about $5,100 per month. Parliament passed a new condominium law, which gives foreigners rights to purchase flats, in January 2016. 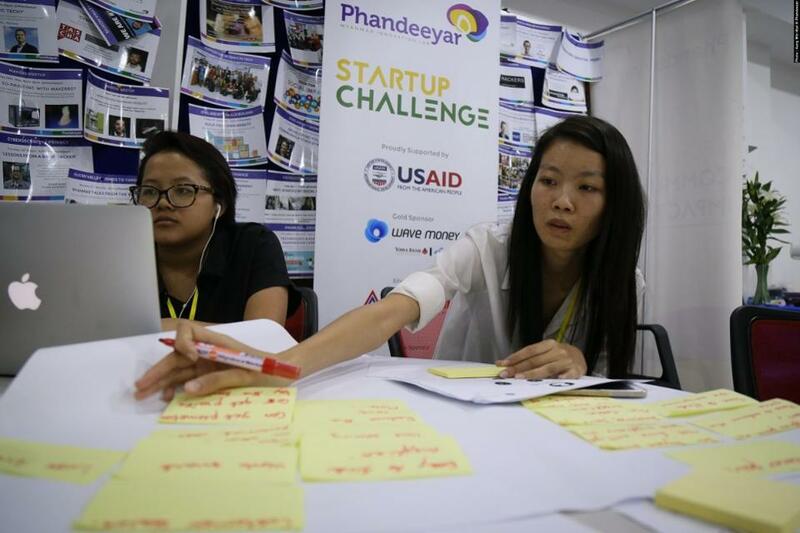 In 2017, the Phandeeyar Accelerator’s Demo Day hosted over 200 local and international investors. 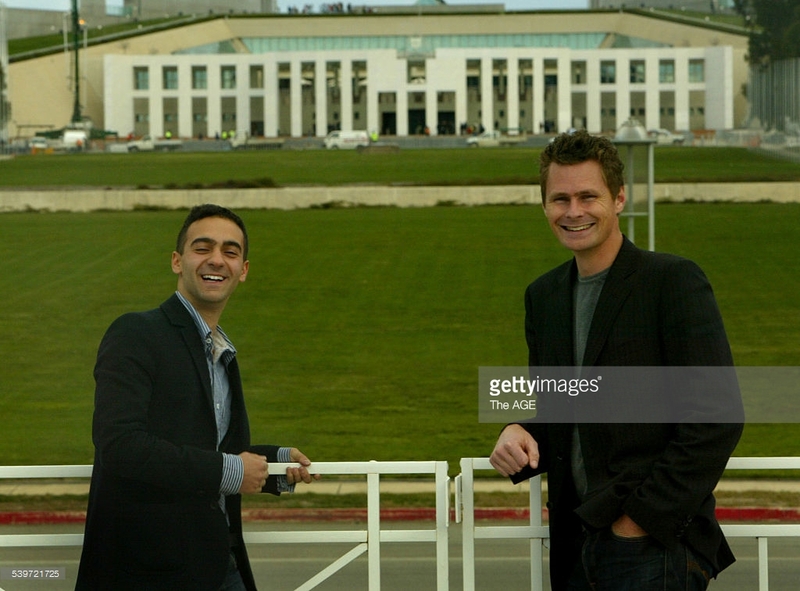 The list included 70 venture capital investors (VCs) and mentors including Red Dot Ventures, Digital Ventures, and Omidyar Network. Note that although the official language of Myranmar is Burmese, spoken by 70-80% of the population, all Burmese speaking in the Phandeeyar demo day video are speaking English. 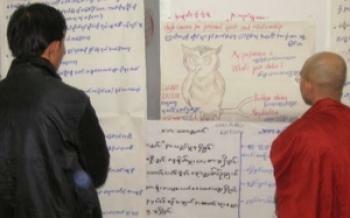 Far be it for Anglo “leaders” to make any concerted effort to speak Burmese, let alone learn the language. This of course is colonization in one of its most accepted and blatant forms. This point is further validated by the fact that Edulink Australia (specializing in English proficiency) is a strategic partner of Phandeeyar. 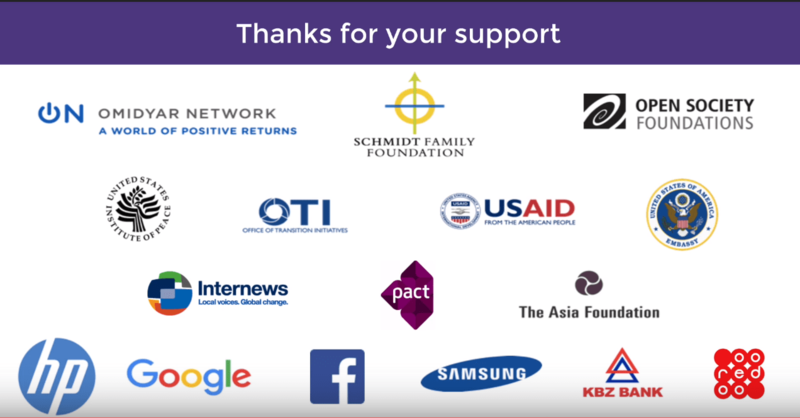 Financiers of Madden’s entrepreneurial tech operations and innovations also include Internews, Facebook, the United States Embassy, Hewitt Packard, Samsung, the US State Department, Pact, Office of Transition Initiatives (USAID), The Asia Foundation, KBZ Bank and Red Dot Ventures. Strategic partners include (but are not limited to) telenor, wave money (telenor, Yoma Bank), Fb Start, AWS Activate (Amazon), JobNet, Microsoft BizSpark, Today Ogilvy Myanmar (“we make brands matter”), Edulink Australia (specializing in English proficiency) and PwC. Here one must note that while Myanmar opens its arms to neoliberal foreign policy, it simultaneously transitions into a playground for the rich – all while the tensions and killings between the Muslim Rohingya, the Buddhist Rakhine, the Burmese authorities, Burmese government and its military escalate. As the so-called human rights NGOs (which are actually in servitude to empire) turn up the volume on this crisis, we must acknowledge there is much more going on behind the scenes that we, in the west, are not cognizant of. For example, terrorist factions such as Islamic State and Al Qaeda have embedded themselves into various Rohingya organizations such as the Rohingya Liberation Organization and the Rohingya Solidarity Organization. The well-documented atrocities and killings of Buddhist Rakhine by the Rohingya go unreported by mainstream media. This has undoubtedly been orchestrated, at least in part, by foreign interests. Exploiting existing divisions is key to controlled chaos and destabilization. Where divisions do not already exist – they are created. What is notable here is that fact that although Avaaz has produced a campaign to bring attention to this tragedy, never do they ask for the world to demand the implementation of a no-fly zone as they have done in countries that reject imperial dominance. It appears as though, if Myanmar does not continue to kowtow sufficiently to foreign interests, an intervention with a no-fly-zone on could easily be the next campaign demand for NGOs to rally behind. However, this is most unlikely as the full transition of Myanmar to western ideologies is already well underway with foreign investment now pouring in. Regardless of the geopolitics involving China and Asia as a whole, the fact is the World Bank has already sunk it’s teeth in. There is simply too much to risk with a full raze of the landscape. Indeed, the Myanmar crisis will prove to be a problematical balancing act of sabotaging Chinese interests while simultaneously attracting foreign investment from western corporations. If necessary, a coup is far more likely to be orchestrated by foreign interests. The crisis being highlighted by international NGOs should be seen as more of a threat – pressure upon Aung San Suu Kyi to ensure complete subservience more than anything else. The key factor is this: interventions by imperial states are never based on protecting human rights. The natural gas pipeline is scheduled to begin carrying 12 billion cu m/year to southwestern China in 2013. Route preparation began in mid-2010, with the first pipes welded in August 2011. The pipeline will parallel the route of the crude pipeline to Ruili. From there it will run to Kunming, the capital of Yunnan province, before extending to Guizhou and Guangxi in South China. 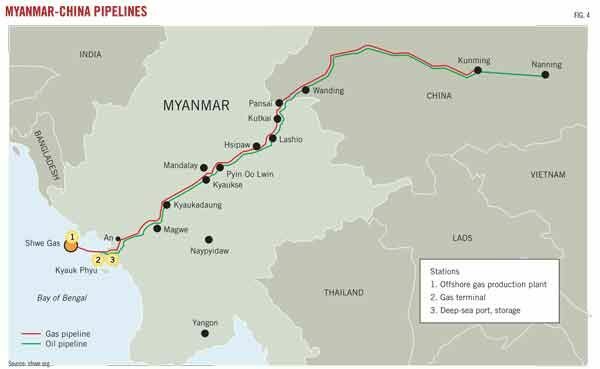 The crude line will transport oil carried by tanker from the Middle East, while the gas line will carry material from Myanmar’s offshore A-1 and A-3 blocks. Total estimated project costs are $1.5 billion for the oil pipeline and $1.04 billion for the gas pipeline. 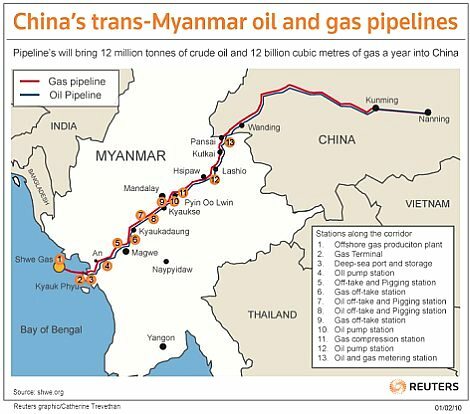 Here it is important to note that 90% of the crude oil going through the Myanmar-to-China pipeline is designated for China – while the bulk of the ecological devastation and social impacts/displacement, has been placed on the Myanmar ecosystems and most vulnerable populations. “…I have worked for years in Sierra Leone, Liberia, Sudan, and Afghanistan for international organizations, and I first got involved in Burma activism in 2001, so I had some experience to bring to understand the dynamics and the groups involved. It is also vital to recall George Soros (a key financial backer of Avaaz at its inception) has long had his eye on Myanmar. The 2003 Council of Foreign Relation’s report titled “Burma: Time For Change,” (“Report of an Independent Task Force Sponsored by the Council on Foreign Relations”) summarized the intentions: “[T]hese recommendations are intended to inform U.S. government actions as well as to increase U.S. cooperation with other countries, especially in Asia, to bring about a long overdue political, economic, and social transformation of Burma.” The independent task force sponsored by the Council on Foreign Relations included 21 task force members (inclusive of George Soros) who were representative/associates of the following organizations, corporations and institutions: Human Rights Watch, Goldwyn International Strategies (an international consulting firm focusing on the geopolitics of energy), the Unocal Corporation (oil and gas), liaisons for Vanity Fair, New York Times, New Republic, U.S News, World Report, The Economist, the Open Society Institute and the Soros Foundations Network, Soros Fund Management, the World Bank, Amnesty International, National Security Council, the Millennium Development Goals, Psychiatry and Public Health, Refugee NGOs, and National Democratic Institute for International Affairs. The seven organizations/institutions represented by eight task force observers were The Century Foundation, The Asia Foundation, U.S. Department of State, Council on Foreign Relations, U.S. House of Representatives, International Crisis Group and the United Nations Department of Political Affairs. 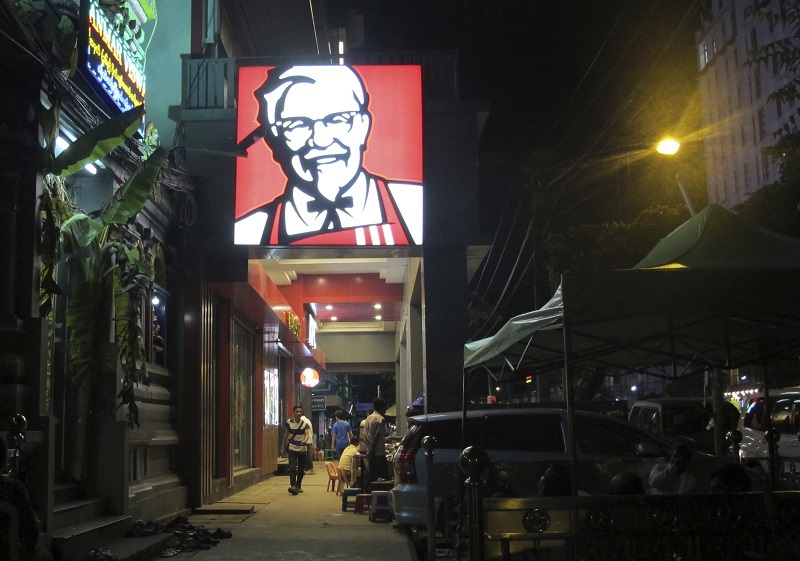 “Like many others, he moved to Yangon to look for work in the sprawling shantytowns that have grown up on the outskirts of the city. 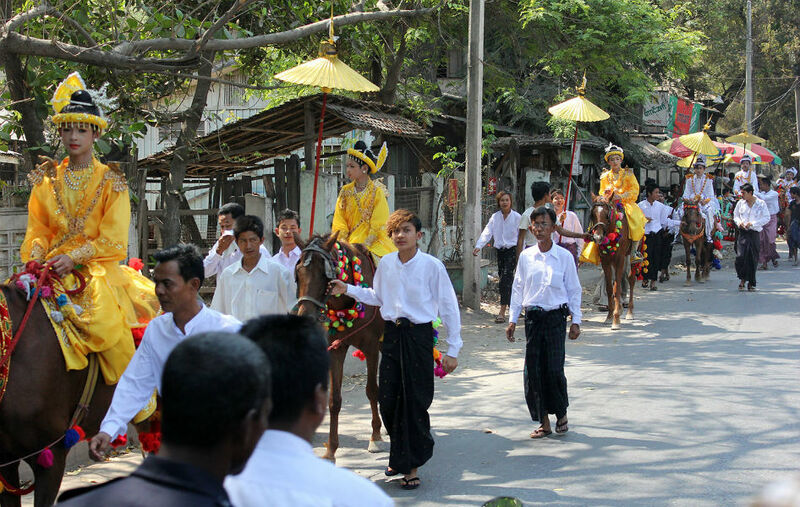 The suburbs are centers of industries that have begun to boom since Myanmar opened to the world in 2011. Factories cordoned off behind iron gates produce everything from salt to garments. But with a new government in power since April, the 555 residents are among hundreds of thousands of informal settlers facing an uncertain future as displacement looms on the horizon again. When their kids were turned away from the official schools, the 555 residents simply built their own. They recruited their own volunteer teachers. On a recent morning, a group of village elders, all men, stood outside and admired their handiwork. Like most of the structures in the area, the single-story school is propped up on wooden stilts to protect it from the rising water. “So flooding is a problem here, but we can build a concrete road, so flooding for two or three hours is OK for us,” says Hla Htay. 555 might not exist, officially, and it might not be good land, but it is home. The word Avaaz apparently translates to “voice”. 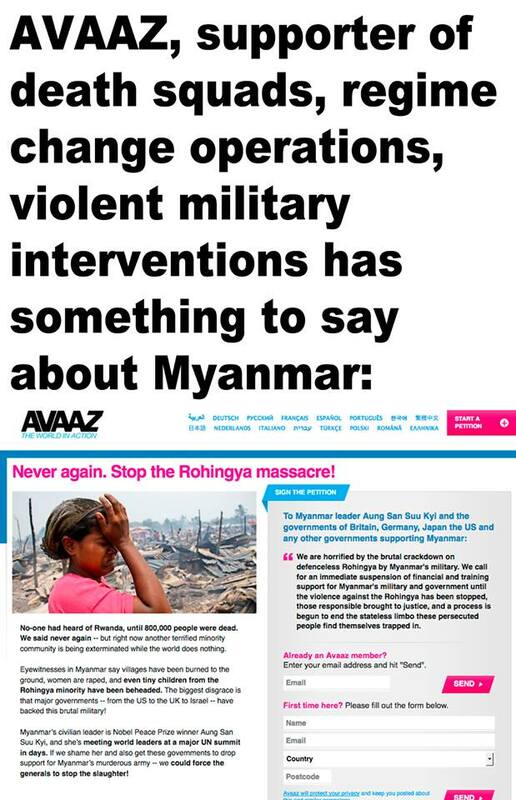 Unfortunately, Avaaz is a voice for the elite power structures that keep the world at large enslaved. Avaaz is a slap in the face to the self-determination of citizens in sovereign countries everywhere. It must be recognized that those who continue to support this organization, with full knowledge of its elite formation, share these paternalistic Western values. Here we go again. Watch! 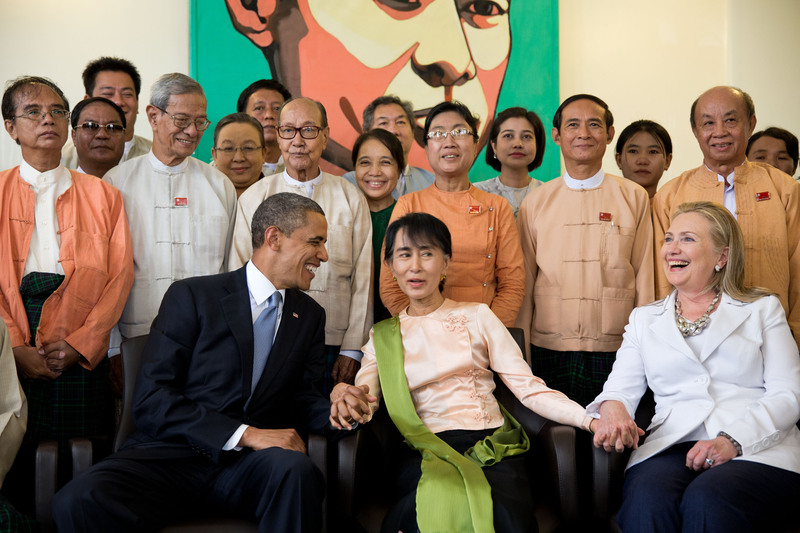 Everyone who gets a Peace Prize starts a major ethnic conflagration: Showbama; Aung San Suu Kyi. T-w-i-s-t-e-d! Wicked.